For even more of my posts on John le Carré, click here. 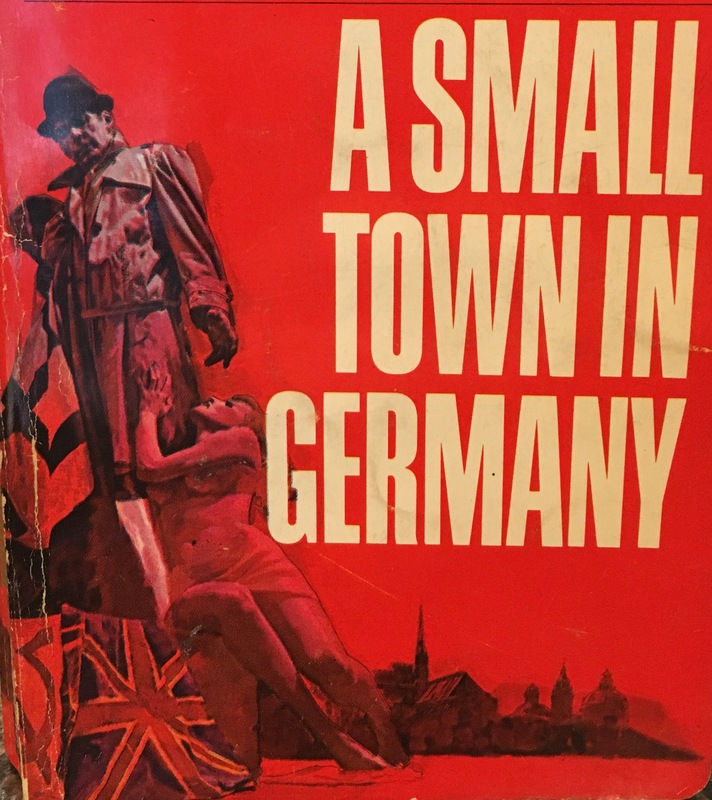 I recently read A Small Town in Germany by John le Carré and loved it. It’s surprisingly maligned by most critics and fans but it’s very readable. The book follows Alan Turner, the Foreign Office cleanup man, as he’s sent to the British embassy in Bonn, Germany to track down some damaging files that have gone missing and Leo Harting, the man who took them. The book does get off to a rocky start, but after the prologue and first couple chapters it finds it’s rhythm. Once it finds its footings, the underlying mystery is quite compelling. Turner, the ostensible hero of the book is a rather distasteful person and the more you learn about Harting, the more you root for him. Eventually all is revealed and it leads to a revelation that shows Turner and Harting both have more in common than we have initially thought. The book has some wonderful character moments with what I found to be some of le Carré’s most vivid characterizations. I love the descriptions le Carré creates for his characters in this novel. Whether describing someone as a “gray-clothed owl of a man, hunched and dried out” or “a ragged, leaky-eyed man permanently crippled by a hangover” he is excellent at creating a quick sketch of a person in your mind. A couple of favorite quotes are below. In the world of the Circus, Steed-Asprey is an intelligence recruiter of the old school. He’s also Smiley’s mentor and a character who looms large in the early Circus books. Which leads me to a conclusion that I haven’t read elsewhere because it is either blindingly obvious or wildly inaccurate. Alan Turner is an intelligence agent working under official cover. De Lisle is the same, possibly even as high as the Chief of Station in Bonn. If de Lisle isn’t I would guess it’s Mickey Crabbe, a drunken member of the staff. Reviewers and critics tend to label Turner as a “Foreign Office investigator” which feels a bit thin. However, it’s well established that intelligence officers work in the embassy but are billed as staff of the Foreign Office. We also know that this is what le Carré did in Bonn, only officially revealing his role as an intelligence officer in 2000. He’s has always talked of feeling bound not to reveal details about that time of his life either due to the Official Secrets Act or out of respect to the agents he ran. I highly doubt he would have felt comfortable revealing details and methods of agents working under official cover in the FO only five years after he left the service. If Turner is an agent, who would pick him up and chauffeur him around but another agent – de Lisle. Any reference to the actual spies stationed at the embassy, whom we know would have been present, are noticeably absent. Is le Carré being a bit of an unreliable narrator? If that is the case, could he resist a little wink to those who knew what to look for? I think not. Hence the reference to Steed-Asprey, the link to Smiley and the intelligence services. I could easily be off base, but the pieces seem to line up. If there is someone with a better sense of how things were run for agents with official cover in the FO, I’d love to hear from you. All of this makes a le Carré rarity I found particularly interesting. Although le Carré attempted to translate this book into a screenplay, Adam Sisman discusses it in his biography and le Carré himself memorably talks of it in The Pigeon Tunnel, the film never happened. Sydney Pollack was the director attached and the entire project fizzled away. 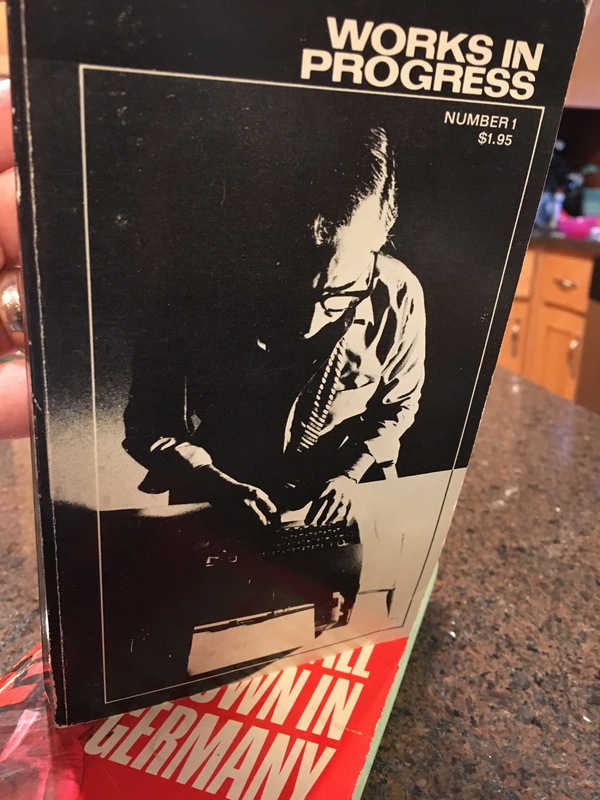 Although I haven’t read the screenplay, Pollack reread it many years after abandoning the project and found it on the cusp of being film ready. Other than a brief glimpse at the start of the novel that doesn’t make sense until the end and book’s finale, Harting is never seen. Everything we learn of him is from third person accounts and that makes this find particularly interesting. 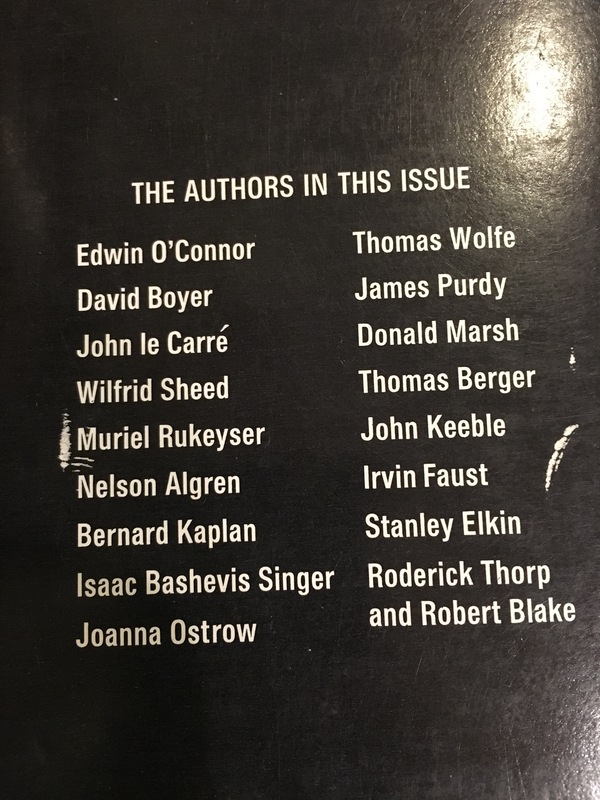 Le Carré’s publisher released a book called Works in Progress that had selections from upcoming books of novelists such as Nelson Algren, Stanley Elkin and Thomas Berger. Most of it was weak sauce, just excerpts of soon to be published novels. 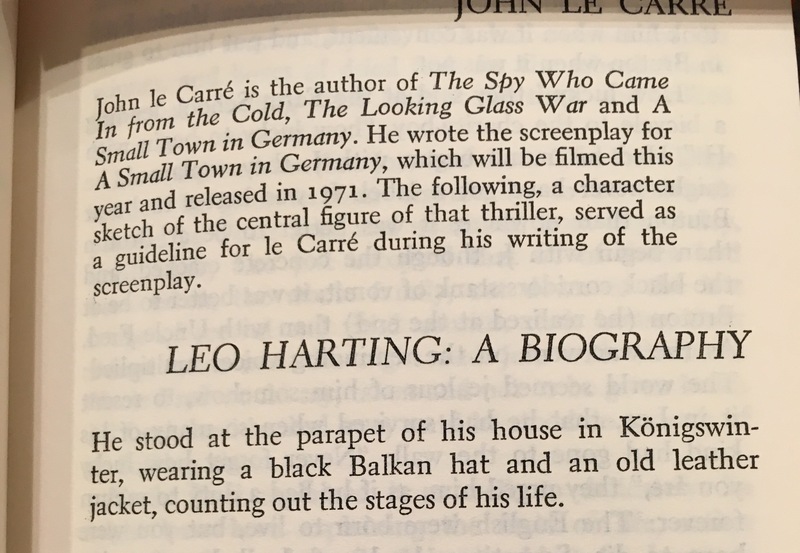 However, it also included a biography of Leo Harting that le Carré wrote as a guide while working on the screenplay. It’s a fascinating and concise look at Harting’s character and motivations that we never saw in the novel. I loved the setting and timing of the book ,Turner I thought was more a Security Operative than an actual spy and he was not of the right class as the higher ups in the embassy. Harting was in fact an unreconstructed refugee ,which are not well represented in most fiction I’ve read.The dispute about the Common Market was the backround and of course no one liked the idea of Facism rising up so soon in Germany .always thought that was why it was panned.The embassy staff play out a great spread of English class system also a common theme.I love the book and even recalled opening sentence describing the tram lines in Bonn. I read this a few years ago and have just finished listening to the audiobook read by the superb Michael Jayston. I had forgotten the end so it brilliant to be caught up in Le Carre’s compelling storytelling again. I didn’t realise it wasn’t popular with critics. Personally, I think it’s a fantastic novel with excellent dialogue, characters, plot and pace. Peter De Lisle could well be station chief, but if he is wouldn’t he take a more active role in the investigation. I don’t think Micky Crabbe is an intelligence officer, he appears to carry little weight with senior diplomats (even though he could probably drink them all under the table!). I do like the descriptions of him too though ‘…and his voice trailed after him like the shreds of his own life’.